The newly renovated one, two and three bedroom apartment homes at Camden Highlands Ridge are located in the renowned city of Highlands Ranch. Inside each apartment home you will find stainless steel appliances, quartz countertops with undermount sinks, white subway tile backsplash, and custom modern white cabinetry with brushed nickel hardware. Hardwood-style flooring, gas fireplaces, large windows, patios, and balconies complete your new apartment. Plus, no need to hunt for a spot because every one of our apartment homes includes a private garage! In addition to easy access to both I-25 and C-470, Camden Highlands Ridge falls in the acclaimed Douglas County School District. Once you explore our community, you will discover it is a perfect retreat from a hard day at work. Take a dip in our resort-style pool and hot tub, enjoy an afternoon at the splash pad, or catch a movie in the theater room. Feel like a workout? Our fitness center is open 24 hours and includes cardio equipment and free weights. Our pet-friendly community has a brand new private fenced dog park, as well as multiple pet stations for your convenience. Plenty of retail and dining options are just across the street, with Park Meadows Mall a few short miles away. Golf courses, hiking trails, and beautiful mountain views compliment your everyday experience at Camden Highlands Ridge! We also have a technology package that boasts savings of up to 51% off retail. This money-saving package includes high-speed internet up to 150 Mbps and over 140 digital video channels through Xfinity. Use the Xfinity Go app on your smartphone or tablet to access your digital video anywhere. Come by today and let us help you find the perfect one, two or three bedroom apartment home at Camden Highlands Ridge. Get the perfect spot! Each apartment home includes a private garage! Residents are provided permits for open parking on a first-come, first-served basis. 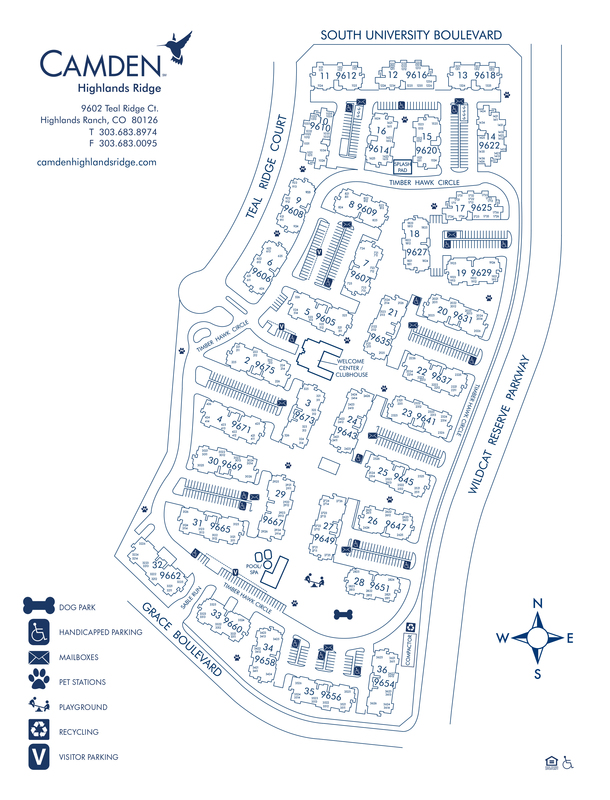 We also offer reserved parking, please call the leasing office for more details. Visitor parking is also available on a first-come, first-served basis.